Hot with their broth, waiting for an herb garnish. We did manage to get down to the market yesterday morning and the summer squash is out in abundance. After days inside focusing on one thing I felt like I was moving through a dream in which the world has exploded with life. It was strange to see the hustle and bustle of the market keep moving although it had been feeling in my heart felt like everything had come to a standstill. 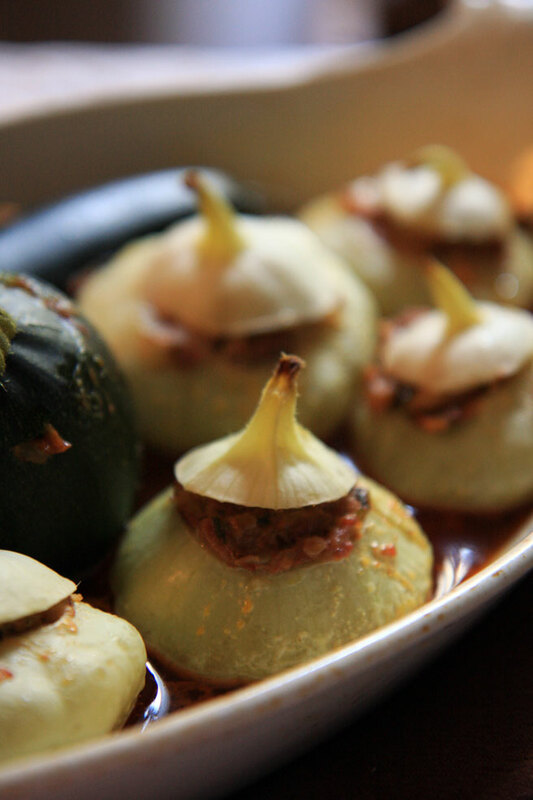 I gathered up the fixings for one very simple French summer staple, stuffed courgette, tomato, or patisson, pattypan squash, and got moving in the kitchen. Just simple work with the hands is what I need. Wash your squash thoroughly, and slice off the caps, reserving them. Hollow them out with the aid of a melon baller or teaspoon with a sharp edge, reserving the flesh of the vegetable. Butter or oil a baking dish, and place the newly hollowed vegetables inside, top side up. Sprinkle a little bit of salt into each one and place their caps on. Set aside. Chop the hollowed out insides of the squash into small cubes. peel and mince the garlic and shallots. Heat the butter in a saute pan until the foam subsides and add the garlic and onion. Let that sizzle for a minute or two, and before it turns brown, add the squash flesh. Toss and stir the contents, the squash will release its juice and then the juice will reduce. Keep tossing it from time to time, for 10 minutes or until the juice reduces. Mince and add the chives and herbs. Put the paprika, sichuan peppercorn, and chipotle pepper into a small pan and let it toast over medium heat, just until it begins to release its aromas. Transfer the toasted spice mix into the squash, garlic, and shallot mixture and incorporate it fully. Remove from heat and transfer to a mixing bowl. Let the spicy mixture cool to room temperature. Stuff the hollowed out squash without packing too tightly, while they are in the baking dish. Place the tops on the vegetables, and cover the whole baking dish with foil. Roast at 200C/400F for 30 to 40 minutes. When you pull the pan out of the oven, a nice layer of broth infused with the flavors of whatever meat you have used, the herbs, and the squash will have accumulated, which can be directly spooned over the stuffed vegetables, hot, at the table. Leftover broth should be reserved and can be used in a vinaigrette for serving with leftovers. 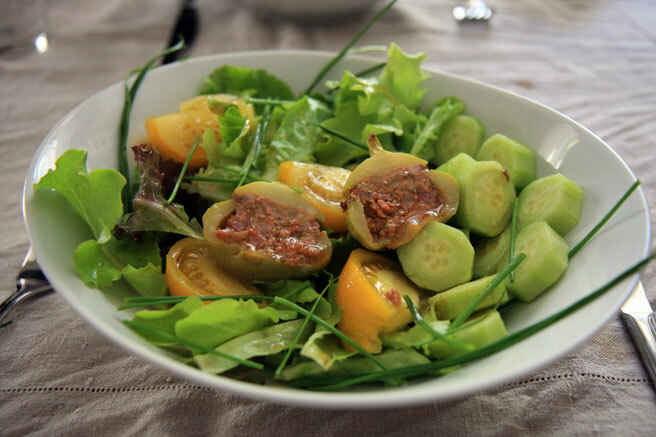 Little cold stuffed pattypan make a nice topping for a salad the day after you prepare them. What a great idea--they look absolutely delicious. The salad looks especially delicious. I love a hearty/light meal like that! You continue to impress me. What an amazing meal you made, especially considering your stress level!! How is Sister Girl doing? I was just about to go to bed but am now drooling. These look fantastic. P.S. Hope Sissy is doing well. What a delicious looking dish......outstanding photos!